Originally published under the title, "Improving Ties between India and Israel." 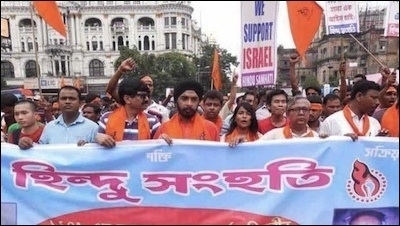 An estimated 20,000 protesters marched in support of Israel in Kolkata, India, during its war with Hamas last August. Relations between India and Israel are changing and improving. It was recently announced that Indian President Pranab Mukherjee will make a state visit to Israel in October, while Prime Minister Narendra Modi is also expected to visit early next year – the first visit of an Indian prime minister to Israel. In February 2015, Israeli defense minister Moshe Ya'alon visited India, during which the two countries finalized a major defense deal worth more than $1.5 billion. No less significantly, we have witnessed a shift in India's traditionally pro-Palestinian stance at the United Nations. Last month, New Delhi abstained from voting on a UN Human Rights Council motion in favor of the Palestinians. (The vote was to accept the Inquiry Commission Report on the 2014 Israeli strikes in Gaza and transfer the file to the International Criminal Court). Indeed, India had already abstained in June on a vote to give UN recognition to an NGO with Hamas links. However, it should be noted that India still does not vote with Israel and the United States, and that both abstentions were related to Hamas (an Islamist terrorist organization). It remains to be seen whether a similar shift can be expected on other Palestinian issues. 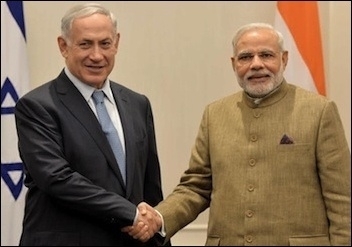 This long-awaited shift in India's position toward Israel is the result of several domestic and international developments. India's ruling Hindu nationalist Bharatiya Janata Party is more sympathetic to Israel than its opponents. First, the Hindu nationalist Bharatiya Janata Party (BJP) returned to power in May 2014. The BJP has always been more favorably disposed toward the Jewish State – a natural ally against Muslim extremism – than the left-leaning Congress Party. Moreover, the BJP's charismatic leader, Prime Minister Modi, has been a good friend of Israel. The BJP is also less sensitive to the large Muslim minority in India (180 million), which is more critical of close ties with Israel. In any case, Islam in that part of the world is more tolerant than in the Middle East. While for many Muslims around the globe, Islam is the dominant component of their identity, this is not necessarily true of India's Muslims. The Indian component of their identity, several thousand years old, precedes the Muslim one. Indeed, about 8 percent of India's Muslims voted for Modi. Second, a large part of the Indian political and bureaucratic establishment, which in the past had evinced a lukewarm attitude toward Israel, nowadays shares the view that the bilateral relations that have intensified since the mid-1990s are very beneficial to India. Multifaceted interactions in the areas of defense industries, counter terrorism, intelligence, agriculture, health, science, and technology have blossomed in recent years. Defense ties, in particular, have been a significant factor in the increased closeness between Jerusalem and New Delhi. Moreover, the lobbies of the two states cooperate in Washington. As India acquires greater global importance, it feels less pressure to please the Arab-Islamic world. Israel understands the importance of India as a rising global power and has directed efforts toward increasing its presence there. The Begin-Sadat Center for Strategic Studies at Bar-Ilan University has led the way in making inroads with think tanks and academics in India, while being very explicit in calling for a change in India's UN voting patterns. Third, international factors that had inhibited good relations with Israel have lost some of their power. As India gradually acquires greater global importance, it feels less pressure to please the Muslim, and particularly the Arab, bloc. The Arab world is in the midst of a deep sociopolitical crisis that will probably last for decades. Moreover, the balance of power in the international oil market has shifted largely towards the buyer. Despite the fact that over eight million Indians are employed in the Gulf, and that most of Indian's oil comes from that area, the international leverage of the Arab countries has been weakened. India has also been bitterly disappointed by the lack of support it receives from Arab states on the Kashmir issue. Prime Minister Narendra Modi with his Israel counterpart, Benjamin Netanyahu, in New York last September. Fourth, India can still plausibly claim that its abstentions at the UN are not a betrayal of its historic support for the struggle of the Palestinians. Nevertheless, New Delhi realizes that Muslim and other states merely pay lip service to the Palestinian issue. The shift in India's position on Israel also reflects several international trends. First, it shows that India is gradually growing into its elevated status on the world scene and increasingly behaves in accordance with its own interests, and with diminished sensitivity to other actors. Although India has always claimed a special role in international affairs, following the end of the Cold War and the liberalization of the Indian economy its potential for great power status is coming to fruition. Second, it reveals the true power of the Arab world. As the Arab tragedy unfolds, particularly since the so-called Arab Spring, the Arab world is in disarray and unable to wield much international pressure. Third, it indicates that the Indo-Israeli relationship has matured and entered into a new stage. India recognizes the importance of relations with the Jewish State and is willing to take into consideration Israel's interests. Obviously, the contents of the bilateral relationship are more important than votes at the United Nations – a morally bankrupt institution. But India's gesture is welcome nonetheless. Finally, India's shift is likely to resonate beyond the corridors of the United Nations, and Third World countries might follow its example. After all, India is considered one of the leaders of the Third World bloc. We have already seen how African countries such as Nigeria have sided with Israel at the United Nations. Israel is a strong country with much to offer the international community, while its Arab enemies are losing influence in the international arena. Indeed, one important lesson from India's behavior is that the fears of international isolation among Israelis are greatly exaggerated. Efraim Inbar, a professor of political studies at Bar-Ilan University, is the director of the Begin-Sadat Center for Strategic Studies and a fellow at the Middle East Forum.